As parents, our baby’s health is always considered as one of our top priorities. Babies can be sensitive to many things – including temperature, food, and water quality. We put great effort to ensure that these things don’t negatively affect our baby’s health. However, quite often, parents underestimate how quickly indoor air quality can be compromised by numerous kinds of pollutants. Air pollutants, such as mold, pollen, and dust, can easily enter your baby’s environment and stay there for a long time. They can come from pets, plants, fireplaces, cigarettes, chemicals, windows, and many other places. In fact, the U.S. Environmental Protection Agency (EPA) ranks indoor air pollution among the top 5 environmental health risks today. Air pollutants exist even if you clean your home regularly and meticulously. In fact, some cleaning products even add to the air pollution in your home. The U.S. EPA has published reports showing that the air in homes can be two to five times more polluted than outdoor air. Unlike adults, babies have underdeveloped lungs — which means they are more susceptible to pollutants such as dust and smoke. These pollutants may lead to asthma, allergies, and other complications. So, it is even more important to ensure that they only breathe clean air. Ban smoking indoors: Cigarette smoke is an air pollutant that can linger for a long time in your home. It can also stay on your clothes. Install exhaust fans: Exhaust fans should be installed in your kitchens, laundry rooms, and bathrooms. Cooking, bathing, and doing the laundry are unavoidable activities that produce a lot of air pollutants. They can be mitigated by installing powerful exhaust fans in your rooms. Avoid storing chemicals near your living areas: Chemicals such as paints, glues, cleaning products, and pesticides produce fumes that may be harmful to you and your baby. Make sure they are stored properly in an area that nobody frequents. Change your HVAC air filters regularly: Dust can accumulate in your air conditioners and heaters easily. Clean them weekly to ensure that they work properly. Minimize using candles, incense, and wood fires: While they can do wonders for the ambience of your home, they also contribute to the pollutants in the air. However, many of the sources of air pollution are outside of your control. Dust from the highway and pollen from plants, for instance, are difficult to regulate. Just by coming home after being exposed to outside environmental factors, you can bring in the air pollutants that have stuck to your clothes. Installing a ventilation system won’t get rid of all the air pollutants in your home – especially the ones that have settled in the nooks and crannies. Ironically, a ventilation system might even let in additional pollutants and change the temperature of your home by letting in hot or cold air. If you only want to improve indoor air quality for your baby, air purifiers might be the option you are looking for. These are portable devices that can target the specific rooms that your baby frequents. Having an air purifier in your baby’s room can help ensure that the air pollutants, which can be easily inhaled by babies, are trapped and neutralized. Most air purifiers run very quietly so your baby isn’t bothered by any noise. Now, it can be quite daunting choosing an air purifier because of all the brands and types available. You might want to consult an in-depth guide if you want to learn more, but if you want a device that is recommended by physicians and used in many hospitals, then the type you want is one with a High-Efficiency Particulate Air (HEPA) Filter. 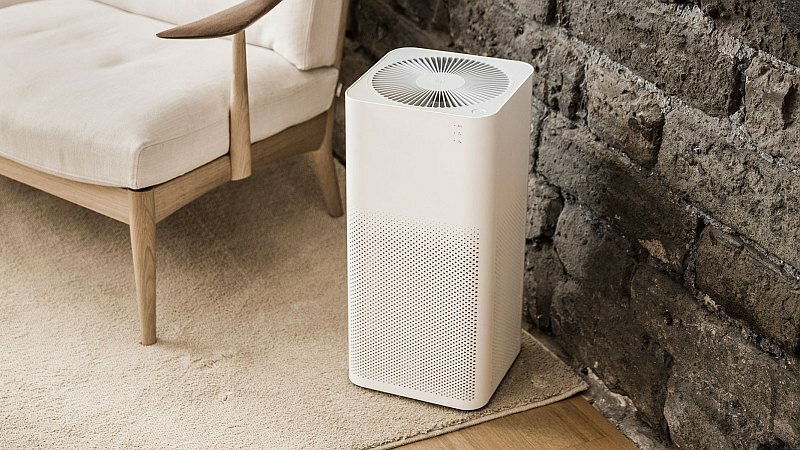 Air purifiers with true HEPA filters, as defined and rated by the U.S. EPA, can capture 99.97% of all harmful particles in the air by using an advanced configuration of fibers. However, because the fibers only capture airborne particles, it has little effect on gases and fumes such as radon and carbon monoxide. If you have a problem with gaseous pollutants, then you should get an air purifier with both HEPA and activated carbon filters. Activated carbon filters can remove smoke, odor, and chemical fumes effectively. This combination can be a bit expensive, but if both air particles and gaseous pollutants are a problem for you, then one that targets both can be a great investment. Before you make a purchase, be wary of air purifiers labelled as “HEPA-Type”. Not only are they confusing to consumers, they are also less effective. Their effectiveness in removing air particles can go as low as only 25%. Stay away from ozone generator types as well. They are dangerous for you and your baby. When choosing an air purifier, you should take into consideration how you will use it to ensure you don’t spend more than you should. Reputable brands have a metric for ‘Maximum Space Coverage’ on their labels. Make sure you buy a unit that can cover the largest room you need to use it in. Next, you should consider the cost of maintaining your air purifier as well. Regularly changing the filters ensures that the device can remove pollutants effectively; however, they can add up to a sizable sum over time. Lastly, you also want your air purifier to be portable. Since you don’t expect your baby to be staying in just one room all day, you should buy a device that you can easily be moved around in your home. While many appliance stores offer payment options that help in reducing the burden of the cost, air purifiers can still be considered an expensive purchase for many of us. However, through regular maintenance, air purifiers can last many years and provide your family members with the healthy air that they need. If you consider the value that the devices add to improving the air quality of your home and protecting your baby from sickness, then they can truly be a worthwhile investment. About M Pimental: M is a happily married Filipino mother to three wonderful little daughters, ages: 8 years, 5 years, and four-months old. Her daily life is a struggle between being the Executive Content Director for Project Female and deciding who gets to watch television next. She specializes in creating and editing content for female empowerment, parenting, beauty, health/nutrition, and lifestyle. As the daughter of two very hardworking people, she was brought up with strict traditional Asian values and yet embraces modern trends like Facebook, vegan cupcakes, and the occasional singing cat video.